I was recently sent over Vanquests brand new SKYCAP Duffle Pack for review. I reached out to Vanquest about a few of their new products for upcoming reviews I have in the works, I will be doing a “Best Duffle” review coming this summer where I am going to feature my favorite new duffles for all types of activities I feature on RMK. The team over at Vanquest ended up giving me a personal call while at work letting me know they were going to send over a duffle for review and give me some early access to the bag. So I will start the review by saying that not many companies that I work with normally go that extra mile and make it more than just an emailed connection. I appreciate what the team over at Vanquest was able to work out with myself and anyone who reads my reviews knows that not only do I like to feature and work with companies that use great materials and research in their products but also ones that don’t skip the customer service aspect. All of Vanquests products come with a limited lifetime warranty. This will be more of an Overview/ First impressions of the Skycap Duffle. I will continue to use the bag while on shift and in my further testing of the duffle and include it in my "Best Duffle" review. The $200 Do-All Duffle Built for Those That "Do"
● Padded main compartment to protect your personal items. I love the direction that Vanquest is going with their new product line which includes the Skycap. I have always thought full 1000D Cordura on a pack or duffle was overkill and them throwing 1000D on the Skycap where it needs it while using 500D Cordura on the rest of the bag is great. The Inside of the duffle, like most of the products from Vanquest, is lined with an orange water-resistant 210D Ripstop nylon. Having this is a much-overlooked feature in the pack world. Being able to open any pocket in the duffle and easily tell where my equipment is very valuable in my line of work. The stitching on the SKYCAP is top notch being reinforced where its needed. All of the zippers on the SKYCAP are YKK and lockable, a nice feature seeing as this duffel is carry on compatible and being able to lock them shut can add some peace of mind. The zippers also feature Vanquest’s special zipper pulls to allow quick and easy opening/closing of the pack. ● High-visibility, lightweight & moisture resistant 210-D Ripstop nylon interior. ● Durable RC-Class YKK® lockable zippers reversed for protection. ● Mil-grade ITW® and UTX-Duraflex® hardware made from high tensile strength Acetal polymer. The SKYCAP comes in at 46L which is the max carry on size for most airlines. This duffle is not your normal duffle as it has more than just one large clumsy main compartment. The SKYCAP has a pocket for everything you could want plus some. 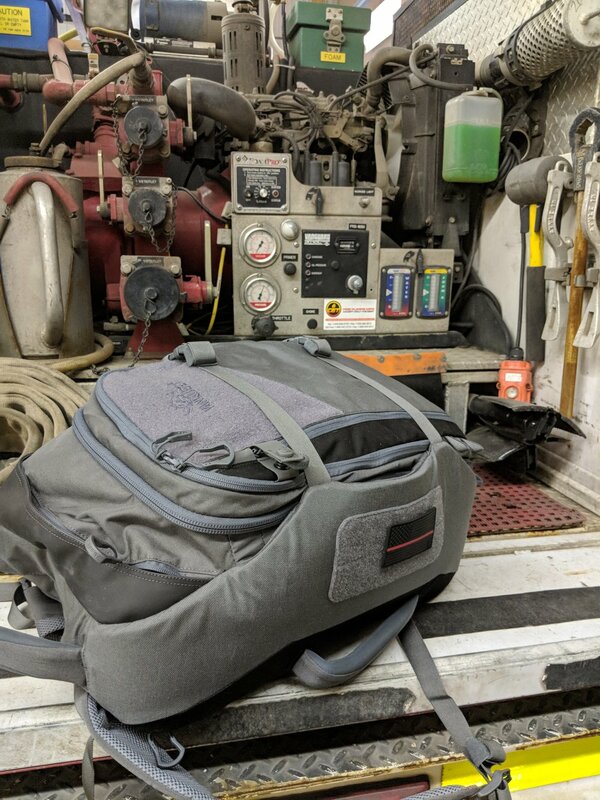 While taking it up to the station with my normal loadout for a 24-hour shift I had plenty of room for a change of gym clothes, shoes, Dopp kit, all of my EDC/Fire tools, books, laptop, tablet, and a whole change of station wear as well. The main compartment held all the bulky items of my loadout while I used the inside pockets for smaller items I still wanted in the main compartment like extra rope and my gloves. On the backside of the flap that zips back when open, there is a small zippered pocket as well. All of the smaller pockets are a zippered, see-through mesh material to help identify what items are inside. The pack is built with more structure than you would expect to find on a duffle of this size. This is due to the EVA foam inside the side panels. 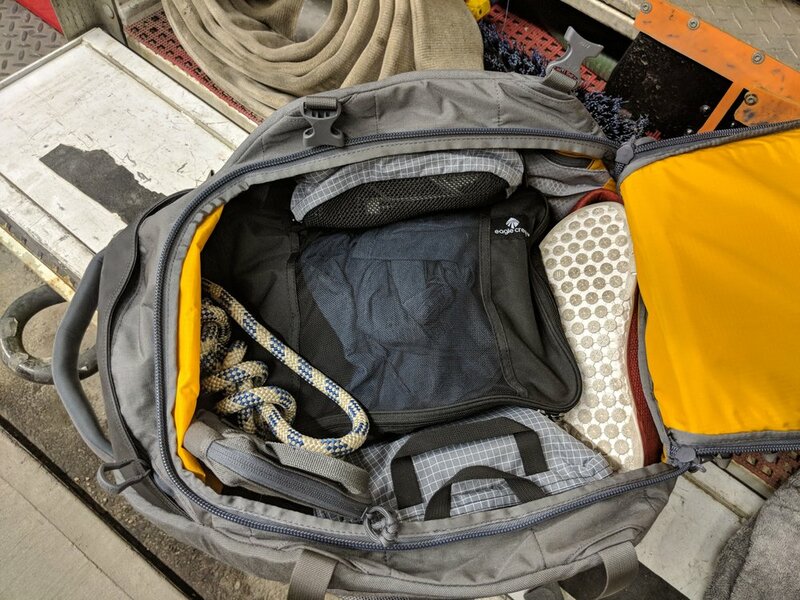 Having this feature can make storing the duffle when not in use somewhat of a tough task however, I would much rather have the extra padding on the side when carrying all of my kit. Another feature of the Skycap that puts it into a league of its own is the addition of a fully loaded “Admin” slot. As I said before many duffles I have had in the consist of one large pocket that turns into a black hole. Having this Admin compartment is a must have if using this duffle for travel or in place of an EDC pack. Inside the Admin I had my tablet, Chromebook, tools, chargers and cords, my department SOPs, and keys. The tablet sleeve and laptop section are both well padded and will do the job at protecting your expensive tech. The laptop sleeve will fit up to a 15” while the tablet will cover anything under 10”. The rest of the Admin section is comprised of an array of smaller pockets for anything else you want quicker access to than the main compartment. On the inside flap, there is an RFID blocking pocket for your wallet, a great feature for travel with the SKYCAP. On the top and bottom of the duffle, there are two smaller pockets for quick access items. There is also one last pocket on the very front of the SKYCAP which works great for an outer layer or some gloves and a cap. The SKYCAP has multiple heavily padded grab handles as well as a zippered compartment on the underside where two fully padded shoulder straps can be folded out and buckled on. This, for the most part, turns the duffle into a large backpack and actually carries very well. The straps are like that of other Vanquest packs and have plenty of padding and support even with the duffle stuffed to the brim. The straps include “load lifters” to help adjust the duffle to the users liking. They also have an included sternum strap which makes carrying those heavy loads even easier. You can also untuck the included padded waist belt if you are carrying the duffle for long distances. One thing I noticed straight away when receiving the SKYCAP was the un-ordinary padded sides. These “wings” are equipped with two horizontal buckled straps and will fold up when buckled. This gives the side of the duffle great structure and extra padding. While unbuckled the wings open up and give you access to the storage of the duffle. A very well thought out piece of the Skycap. The side panels can also be folded down while the bag is empty. When the bag is empy it can be somewhat bulky and it is nice to be able to fold the wings down to help with storage. The Skycap from Vanquest is one of the most unique and functional duffles I have had the pleasure of using here at RMK. It has a great blend of new/unconventional features with tried and true notes of Vanquest that have gotten the company the name they have today. With the mixture of the 500D - 1000D Cordura, it should hold up to anything you can throw at it. The Skycap seems to have a place for everything which is rare for a duffle bag and something I will have a tough time adjusting to when I use another duffle. I can’t wait to truly push this duffle to the limits this summer, however, if it's anything like past Vanquest products I have had I will have my work cut out for me. Stay tuned for a follow-up review and thoughts.